The previous post looked at emissions news from Canada's federal government - but most of my original data work, and writing, is on my province of Ontario which is making all sorts of announcements and rash moves lately. The commentary around actions related to climate change is often ridiculous -in places not noted for being so. The carbon tax would work best if complemented by a second policy that requires the Alberta electricity sector to reduce its emissions by 80 per cent over the next decade, in line with what Ontario achieved from 2004 to 2014. Focused on coal-fired power plants, this regulation would be slightly more stringent (but less complicated) than the one President Barack Obama is implementing in the United States. In one decade, Alberta’s coal-fired power plants would have to retrofit to capture carbon emissions, like Saskatchewan’s Boundary Dam power plant, or shift to wind and other renewables backed by natural gas, as Ontario did. Thanks to the falling costs of wind and natural gas, the effect on electricity prices would be negligible over the decade. Jaccard should know better, by now. 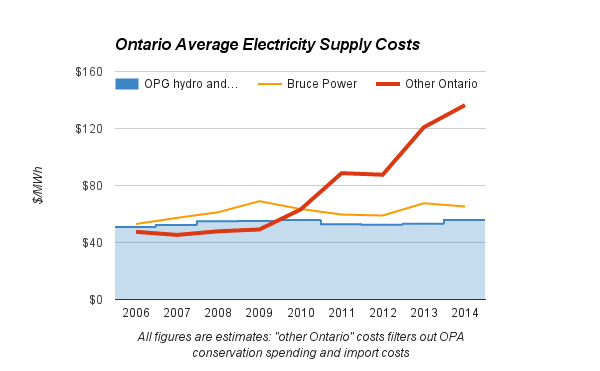 The star of Ontario's coal phase-out is nuclear. Nuclear 59.4 in 2000 (NIR), 94.9 TWh in 2014 (35.5 TWh up). Coal down 40.7, nuclear up 35.5. This isn't a hard association for an honest man to make. Jaccard co-wrote a book with Jeffrey Simpson, who also appeared in the Globe this weekend to champion his Premier, and guess what caught his wrath? The most obvious potential synergy between them – hydroelectric power – was neglected when, decades ago, Ontario decided to go nuclear and Quebec began shipping its vast hydro surplus to the United States. Ontario is now saddled with Candu reactors that will cost a huge amount to refurbish. Worse, Candu technology has lost its lustre around the world. CANDU is short for CANada Deuterium Uranium - Candu is the current name of a company, not the technology. The last CANDU reactor to begin construction in Ontario did so in 1985. Simpson's work is poorly researched and needlessly written. I'll note a recent report showed emissions of 7 MtCO2e in 2014, that on about 154 million megawatt-hours of generation: that's an emissions intensity per kilowatt-hours of under 46 grams; spectacular by global standards. This past week Ontario announced an emissions reduction target for 2030. Hopefully my previous post communicated I'm not real impressed by the target game - my post was heavily influenced by Green is the Old White, which I wrote three years ago on a wealthy world's disinterest in talking about sustainable development in a location with less than ideal hotel facilities, and the racial composition of the Ontario Clean Energy Task Force. I noted at the time the group lacked diversity and qualification; three years later the group also lacks accomplishments. Ontario's target announcement predictably follows an announcement a month earlier to enter the Western Climate Initiative (WCI). The WCI membership comes with a commitment to a cap-and-trade scheme. This was predicted by David McLaughlin a month prior to that when the ggovernment announced a "Climate Action Group." which McLaughlin claimed included "Climate change adviser's experts in field." A couple, maybe, but once again the Ontario government has created a "green" group lacking ethnic diversity, and once again, as McLaughlin's observation shows, it lacks a diversity of expertise too. OSPE is rightly concerned that the knowledge and expertise that practising engineers possess with regards to climate change and its impact on infrastructure, soil and energy conservation will not be readily available to the minister. Engineers understand the requirements for innovative, sustainable and efficient building designs, the negative affect energy policy decisions can have on GHG emissions and the impact climate change has on soil and the great lakes ecosystem, to name but a few examples. Engineers are creating leading technologies that Ontario will need to combat climate change, and it is unfathomable that this expertise is being ignored by the Ministry of the Environment and Climate Change. When appointments are not made on accomplishment they are made on that gut instinct that produces groups that don't look like a sample of Toronto's population, instead displaying the group selector's prejudices. I hope Rachel Notley need not note that. I'm amazed Jaccard would say something like "shift to wind and other renewables backed by natural gas, as Ontario did." You'd figure he ought to know full well that nuclear replaced coal in Ontario. I mean, he has only spent the last three decades studying this stuff. I'm also amazed anybody would seriously tout this claptrap hype about Boundary Dam. Then again, I'm actually not amazed. The official Canadian climate illuminati are as useless as breasts on a male bovine. In related news, the concentration of carbon dioxide in the global atmosphere, as measured at the Keeling observatory in Hawaii, hit 404 parts per million. I believe that is the highest measurement yet taken there. With geniuses like Mark Jaccard leading the way, no surprise. I missed this footnote in reporting: "National totals exclude all GHGs from the Land Use, Land-use Change and Forestry Sector." I didn't think many people took the land-use figures very seriously, and it's another reason why it would be simply stupid for Canada to use 1990 as a baseline for a target set at the end of 1997 by a regime with no intention of meeting it (Chretien's). I'd also point out Europe's population is stagnant, whereas Canada's is not - and it was always expected to have net immigration by global warming alarmists too. 0 ghg growth in Europe over time is equivalent to a steep drop in Canada's much harsher, over the course of a year, climate.